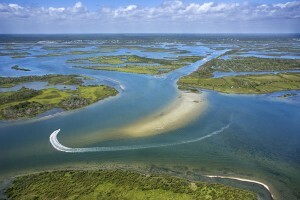 Georgia’s coastal waters provide a haven for dolphins, creatures that have charmed mankind since the days of Aristotle. High intelligence, an extremely social nature and a fascinating propensity for play have attracted people to dolphins for centuries. Books, movies and television shows have showcased what has always seemed to be an intrinsic connection to the species, from the brave and friendly companion in “Flipper” and hyper-intelligent animals in “The Hitchhiker’s Guide to the Galaxy,” to the real-life, wild pods in the recent documentary “The Cove.” The link between human beings and these smart cetaceans may be stronger than we think, however, and researchers are working to find out just how inextricably connected we are. drive hunts in Japan. She also co-authored a significant study that demonstrated dolphins’ ability to identify themselves in mirrors—intelligence that has only been demonstrated elsewhere by humans, great apes, elephants and magpies. 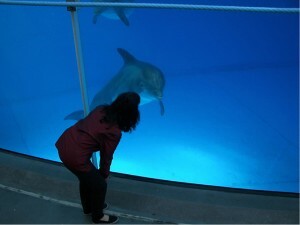 Beyond protecting an intelligent, sensitive animal, learning more about dolphins results in another important benefit. Much like the canary in the coal mine, the species can be an early indicator for many environmental changes and dangers that will ultimately affect humans. “As goes their health, so goes the health of the ecosystem they rely on,” Racanelli explains. “It’s been said that we are all downstream from someone else. Because they live their lives at sea level, dolphins are downstream from all of us, which means whatever we send them from our terrestrial world … has nowhere else to go.” Fortunately, researchers like Reiss are keeping a close eye on these crucial cetaceans. 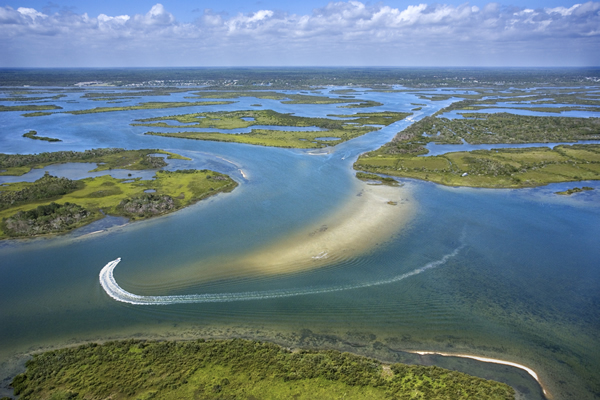 Due to its islands, marshes, estuaries, rivers and creeks, Georgia boasts 3,400 miles of tidal shoreline. Such an abundance provides the perfect setting for the bottlenose dolphin. Georgia’s coastline is the perfect playground for different types of dolphins. Dolphins in their natural habitat are often spotted by those along Georgia’s coast, including Sea Island’s residents and visitors who are out on the water or even taking a stroll on the beach. The dolphins that can be seen in shallower waters, including closer to the coast and in estuaries, are identified as inshore dolphins. Inshore or estuarine dolphins have larger flippers, are 6 to 8 feet long and are pale gray. 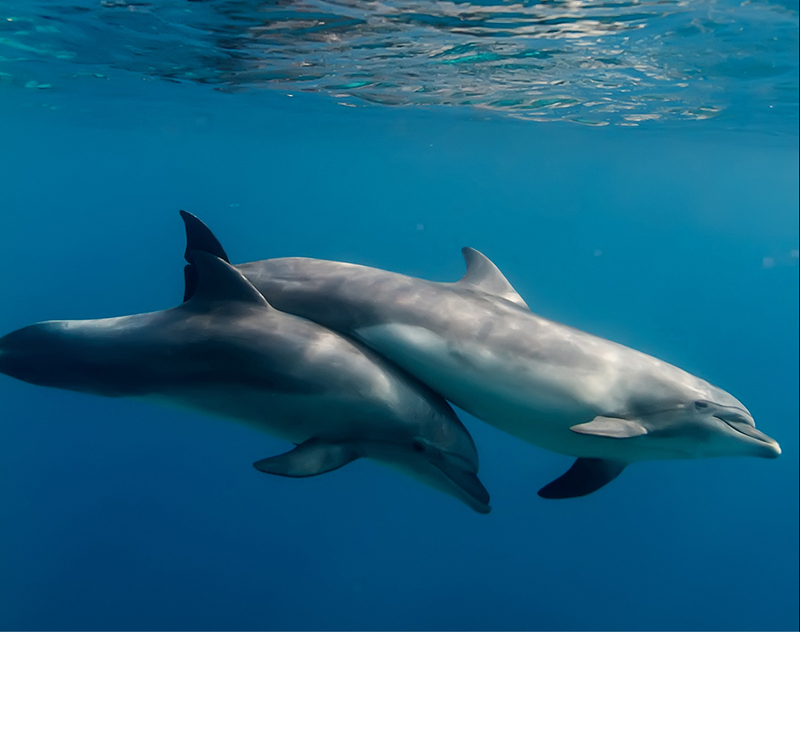 Offshore dolphins can grow up to 12 feet long and have small flippers. They’re dark, almost black, and migrate from New Jersey down the entire Eastern Seaboard, spending cool-weather months in warmer Caribbean waters. Although dolphins can swim 100 miles a day, estuarine or resident dolphins have a home range in which they tend to stay. Additionally, dolphins live in a matriarchal society, in what scientists call a “fission fusion” structure, meaning they come together and then separate, with males coming and going. Calves, however, stay with mothers anywhere from three to six years. “In field studies, you’ll often see the same animals together,” Reiss explains. “They’ll have these tight groups, then they mix with other groups to form larger groups as well.” This occurs throughout dolphins’ lives, which can sometimes last more than 50 years. “Sometimes we think that intelligence is equated with having an opposable thumb,” says Reiss. Her research indicates that dolphins blow that theory out of the water. 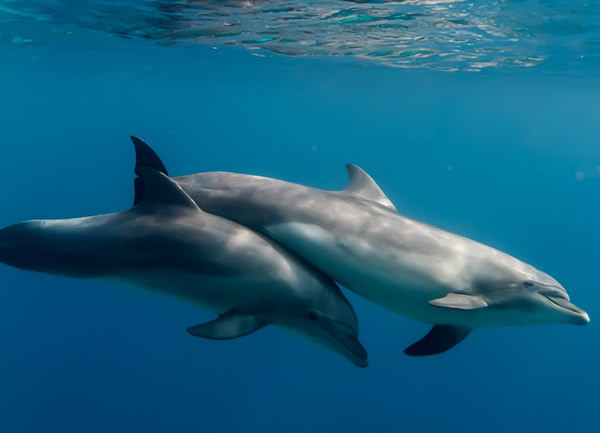 “One of our earlier papers showed that dolphins can create their own objects of play.” The dolphins she studied blew bubble rings from their blowholes and figured out that if they touched them, the rings dissipated. To prolong the life of their self-made toy, they moved it by blowing air or spitting water at it. Dolphins will also manipulate these rings by biting them to cut them in two, sometimes sending one through the other with an extra push. More evidence of dolphins’ intelligence can be found in the animals’ interaction with mirrors. 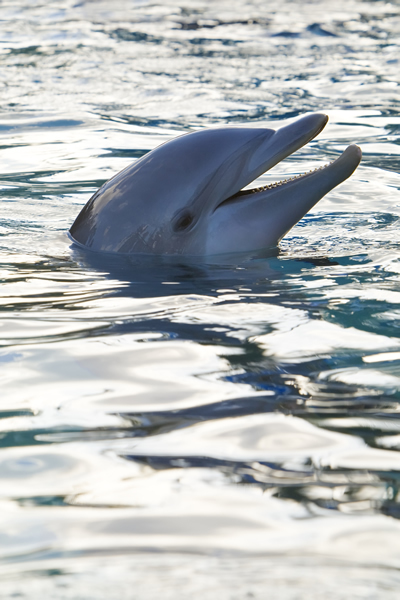 In 2001, Reiss published a paper showing that dolphins, like humans and great apes, have the cognitive ability to recognize themselves in reflective surfaces. “It may seem simple to us, but it suggests a very high level of self awareness,” Reiss says. She and Frans de Waal, a chimpanzee researcher at Emory University, continued the study with three adult female elephants and got the same results. 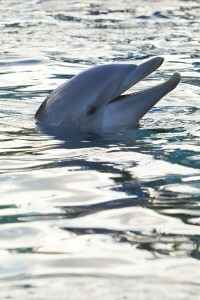 Dolphins have acute vision above and below water. 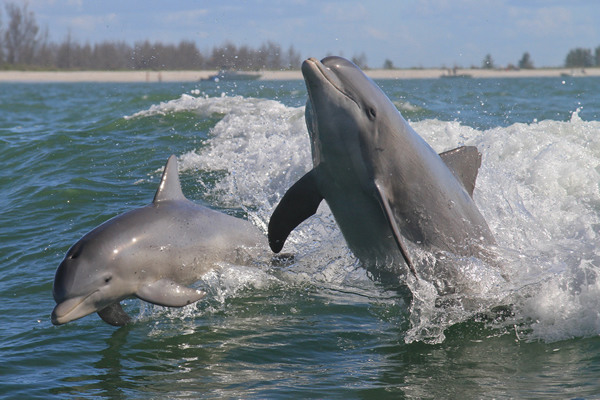 Threats to dolphin populations do exist in the U.S., however. Much of the damage done domestically is through ignorance or misplaced affection. 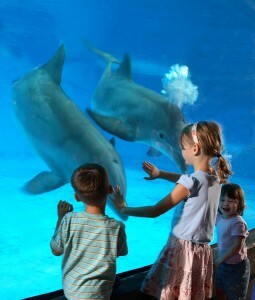 A large misconception many people have of dolphins is that they are all friendly. The animals may approach boats or swimmers, but oftentimes, the animals are merely curious. Use reputable boat operators who maintain a 50-yard distance from dolphins. If narrow waterways prevent that, stop the boat propeller and cautiously float past the dolphins. Never feed wild dolphins. Almost anything fed to a dolphin is not healthy for them. Feeding also trains them to beg boats for food. Touching the animals is illegal.